Apple's New iPhone 4S: Is It Too Little, Too Late? Ever since Apple launched its first iPhone, it has been considered an iconic and revolutionary device by all and sundry. Moreover, Apple has this habit of pleasantly shocking consumers with better innovations every time a new model is launched. Therefore, expectations are always high when a new Apple gadget is just around the corner. But this time around, things are different. The company usually launches its new products during June-July, but those months came and went without any significant announcements. Then rumours about a new iPhone started doing the rounds and a launch date was finalised â€“ it would be October 4. Well, the momentous day finally came (after 15 months, if you remember) and everyone â€“ right from media people to consumers to rival companies â€“ waited with bated breath for the next 'wonder' to be unveiled. This was Tim Cook's official debut as Apple Inc.'s CEO and everyone was expecting something ground-breaking (including us, we have even written about it earlier). But unfortunately, that was not to be. A new iPhone has been launched but there is nothing to write home about. And before we tell you why, let us have a close look at the new version, codenamed iPhone 4S. The iPhone 4S will come in either black or white and will be initially available in seven countries, from October 14, followed by another 22 on October 28 and 70 more countries by the end of the year. Customers can also pre-order their devices from October 7. Apple will be launching with more than 100 carriers, making it the fastest and widest iPhone launch ever. The price of the iPhone 4S in the USA (with a contract) is $199 (around Rs 9,500), $299 (around Rs 14,000) and $399 (around Rs 19,000) for the 16 GB, 32 GB and 64 GB model, respectively. First things first â€“ so here comes the list of 'great' features you are bound to appreciate. The iPhone 4S runs on Apple's dual-core A5 chip (an improvement, since the iPhone 4 uses the A4 chip), which will ensure twice the processing power and seven times faster graphics than its immediate predecessor "the iPhone 4. The internal storage has been increased and Apple has introduced a new 64 GB model of the iPhone 4S, along with the 16 GB and the 32 GB versions. Also, iCloud (a set of free Cloud services that include iTunes in the Cloud, photo streaming and documents in the Cloud) works seamlessly with the new iPhone and the device also has Apple's latest mobile operating system, the iOS 5, which comes with more than 200 new features. For example, a notification center has been provided that enables users to view and manage notifications in one place "the iMessage â€“ a new messaging service for sending text messages, photos and videos to all iOS 5 users. Incidentally, the iOS 5 will be available as a free software update for iPhone 4 and iPhone 3GS. "The iPhone 4S plus iOS 5 plus iCloud is a breakthrough combination that makes the iPhone 4S the best iPhone ever. Only iPhone can deliver these innovations that work seamlessly together," said Philip Schiller, Apple's senior vice-president of worldwide product marketing. The iPhone 4S comes with an 8 mega pixel auto-focus camera with LED flash (and a new custom lens and a larger f/2.4 aperture), an improvement from the 5 MP camera in the iPhone 4. Plus, the backside-illuminated CMOS sensor gives 73 per cent more light. The video-recording capability has improved as well â€“ this one can shoot full HD (1080p) videos in comparison to the iPhone 4 that only shoots HD (720p) videos. The front facing VGA camera in the iPhone 4S remains the same as in the previous model. The company claims that the camera app will launch much faster and the shot-to-shot capability will be twice as fast in the new mobile phone. Additionally, the new photos app will allow users to crop, rotate, remove red-eye and organise their photos into albums, so that these can be shared on the go. 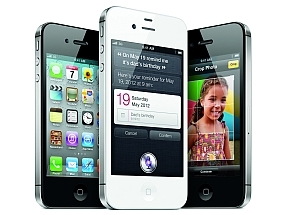 The iPhone 4S also comes with Siri, the in-built voice recognition software, which helps users get things done via voice commands. The best thing about Siri is that it understands the context of the question and gives you the necessary information. For instance, just ask if you will need an umbrella this weekend and it will comprehend that you are looking for weather forecast. You can also use Siri for making calls, sending text or e-mail messages and getting directions, among other things. The stainless steel exterior and dual-antenna design of iPhone 4 has been improved as well and the iPhone 4S now supports twice the download speed. In fact, Apple is calling it a world phone as it can run on both CDMA and GSM networks. Unfortunately, there is a long list this time, which is very rare when it comes to Apple products. However, let us start with the form factor. It is true that the sleek and chic stainless steel exterior of iPhone 4 was loved by many, but Apple should have opted for a new one for the new iPhone 4S, rather than sticking to the earlier design. After all, the Cupertino company stands for continuous innovation and it should have come out with a new design that would wow consumers across the globe. Apple had full 15 months to give it a try and develop a brand new design which could have been a great crowd-puller. Then again, Apple has chosen to stick to the same screen size and resolution as that of its predecessor. It may not be deemed a wise move, especially when the company is facing cut-throat competition from the likes of Samsung, HTC and Nokia, among others. In fact, Apple's competitors are coming up with vastly improved mobile devices which have bigger screens and better resolution. For example, Samsung's Galaxy Note boasts a 5.3 inch screen â€“ a high-definition super AMOLED multi-touch display with 1200Ã—800 screen resolution. However, the iPhone scores on pixels per inch â€“ 326 ppi, compared to Note's 285 ppi. The battery life has not been vastly improved either. Apple claims that the new version offers 8 hours of 3G talk time, 14 hours of 2G talk time and 200 hours of stand-by time. Also, Indians may face problems while using Siri as the Indian accent is significantly different from standard American or British accent. Additionally, voice-controlled devices cause a lot of problems in recognising Indian names â€“ an issue that many of us must have faced when using voice-dialling. Finally, no details are there on the Apple site about the pricing and availability of the device in India, which usually means we may have to wait a long time (last time, Indian consumers had to wait a whole year) to get our hands on the iPhone 4S. India does not figure in the first two stages of launch, although Tim Cook says that Apple is likely to witness maximum growth in the emerging countries. Of course, you can always get a jail-broken device but we are not considering that here. We never thought we would say this (personally, I am an Apple fan) but you can actually give the new iPhone a miss and opt for other upcoming ones with better configurations and larger screens.